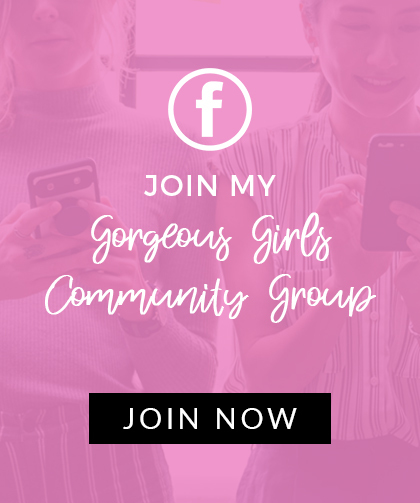 I’m so excited to share this post with y’all! 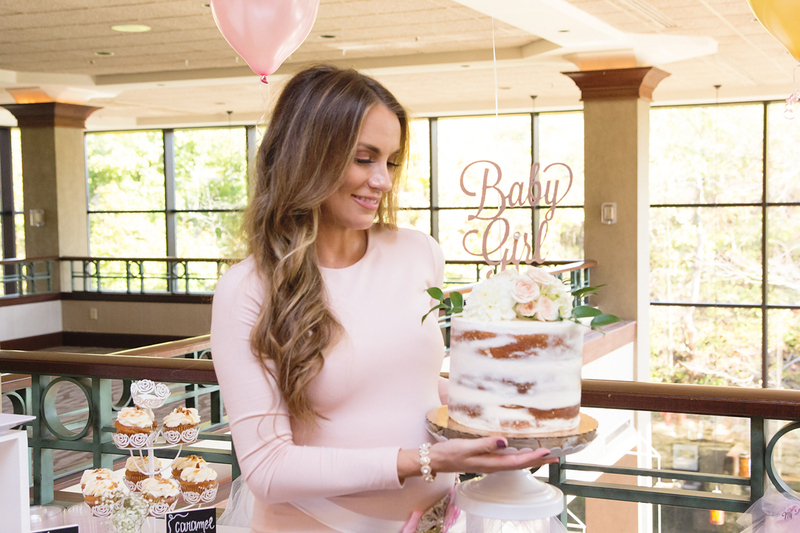 In case you missed it, earlier this month I shared what I wore to my Ohio baby shower in this post. 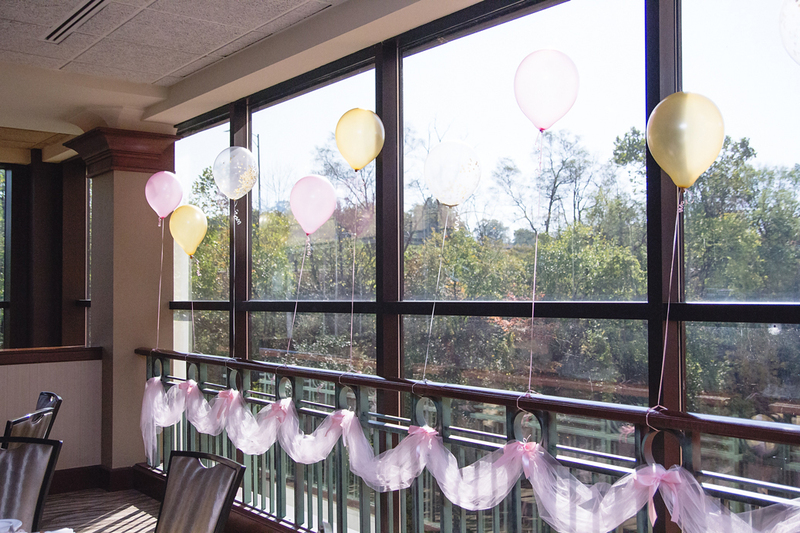 The shower was hosted at the Sheraton in Cuyahoga Falls, in the room overlooking the river. 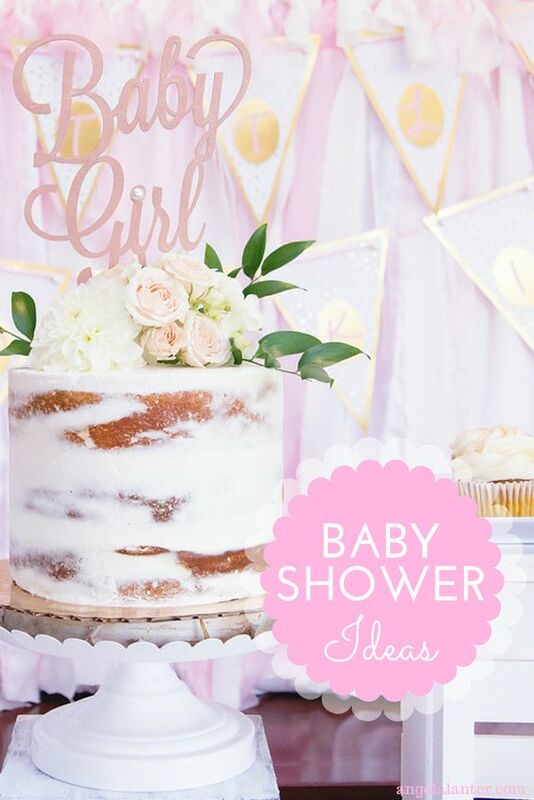 I’m sharing the shower and all the fun details with you in today’s post. 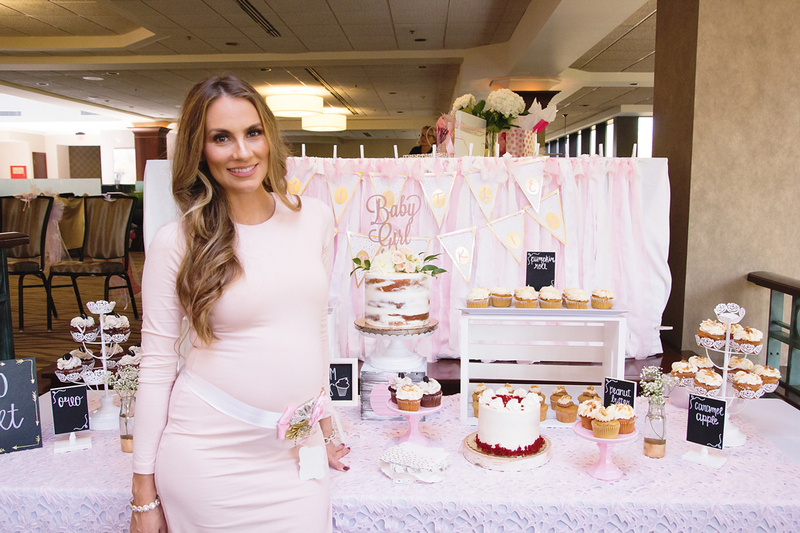 This week on Hello Bump Podcast, Matt and I chatted about our trip home to Ohio and the shower… But now, I get to actually show you how everything turned out. First up, and let’s be honest, most importantly, is desserts. 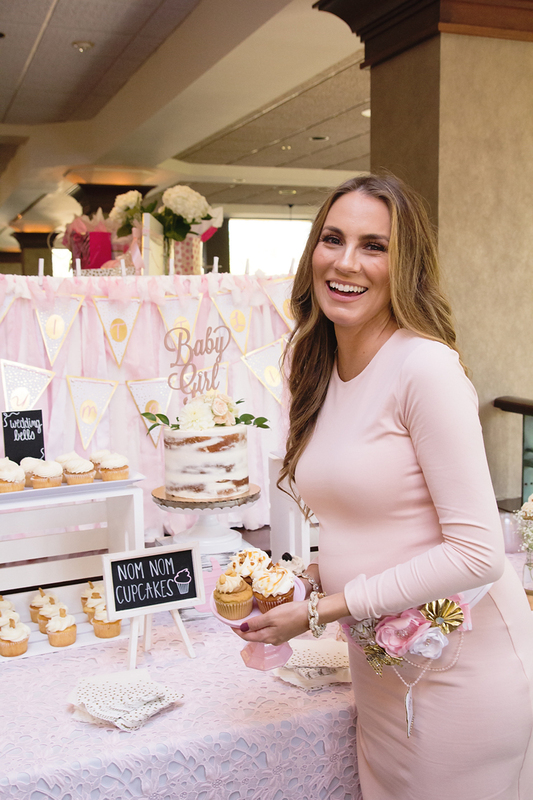 The desserts and dessert table were adorable. My mom and cousin Mindy made these darling white and pink wreaths that you see above. If you look closely, the details are so cute. The wreath on the far left has a rocking horse and the wreath on the far right has a tiny white dress. 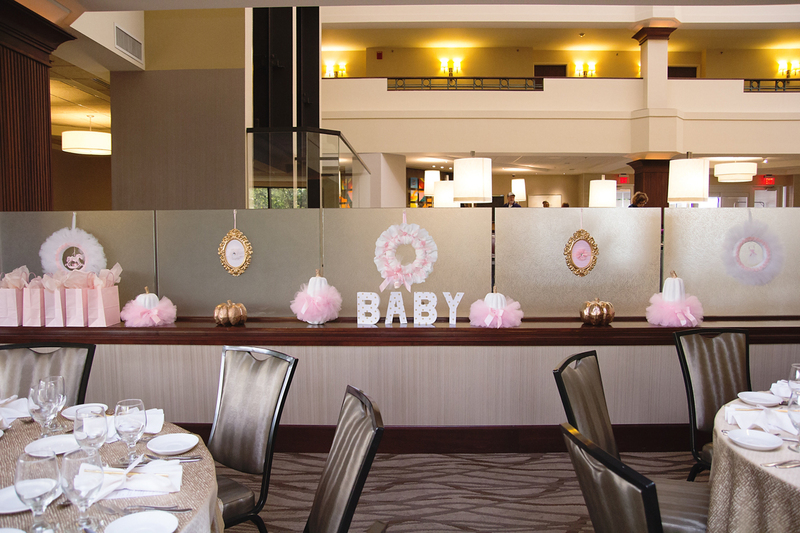 Don’t miss the white pumpkins with pink tutus ad rose gold pumpkins along the ledge as well. My mom and cousin repurposed this changing table as the welcome sign at the entrance of the shower. I love that they found a Hello Gorgeous pillow. The gold pumpkin on the top shelf was our guestbook. Guests signed in with a white marker, so cute! The pom poms on the middle shelf were all over the shower and so cute. The tissue paper pom poms were from Paper White Designs. On the bottom shelf, the white blanket was mine as a baby and was knitted by my mom’s best friend’s (my Mama Jean) grandmother. Don’t you love the Hello Bump sign?! Under the sign is a stack of my favorite books as a little girl. I loved this little corner. 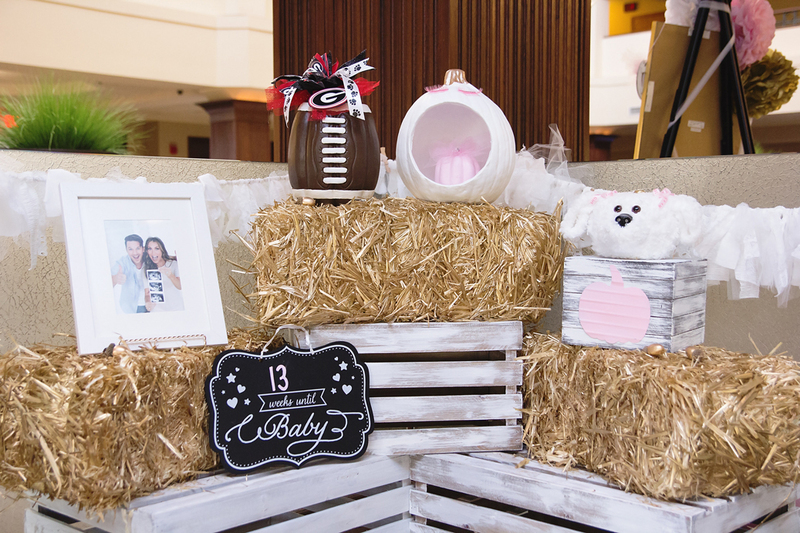 My mom and cousin Mindy made these pumpkins: UGA for daddy, the glam pumpkin (hello pink lashes) with a baby pink pumpkin in the belly for me and even a Soka pumpkin too! 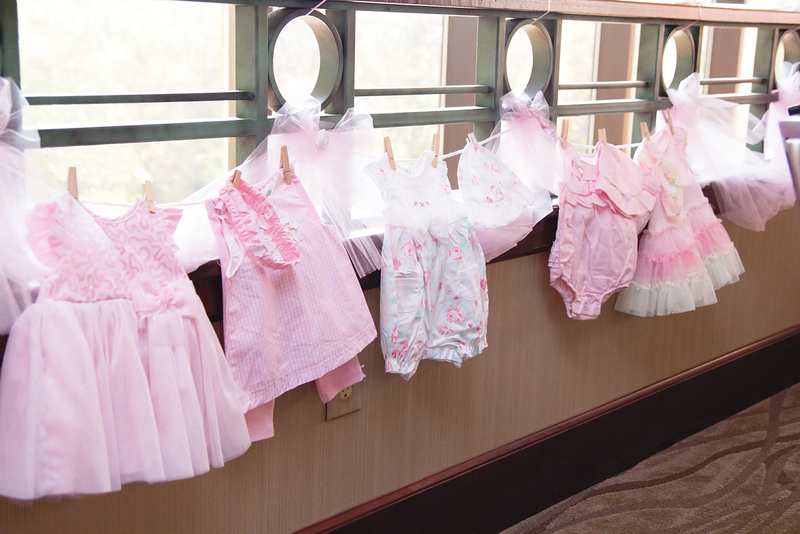 Along the other wall was a clothesline of baby girl clothes from one of my favorite brands, Little Me. 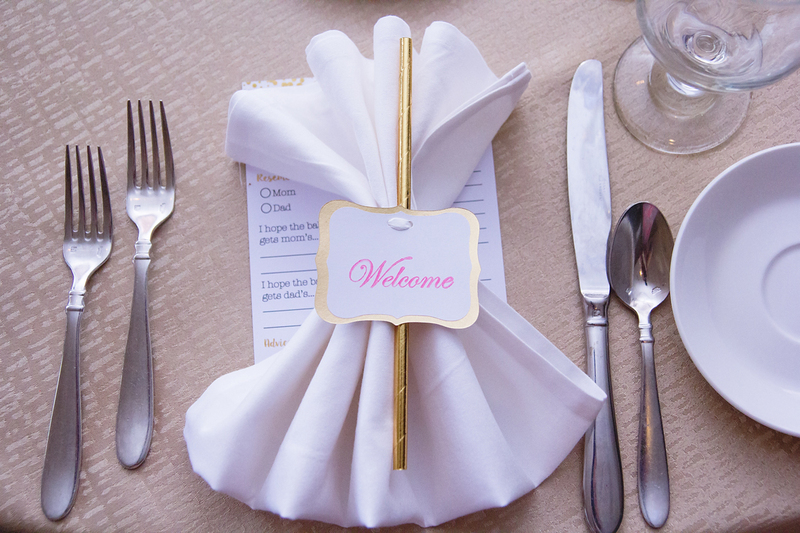 My Aunt Patty made these cute Welcome napkin holders paired with gold straws for each place setting. Last but not least, the favors. Essie nail polish is hands down my favorite polish brand, so of course I’m going to pass down my pink polish love to my little girl. Loved the personal touch of the Essie pink polishes with the “Tickled Pink” tags made also by my Aunt Patty. Aren’t all the details and special touches so perfect? The shower couldn’t have been more perfect. 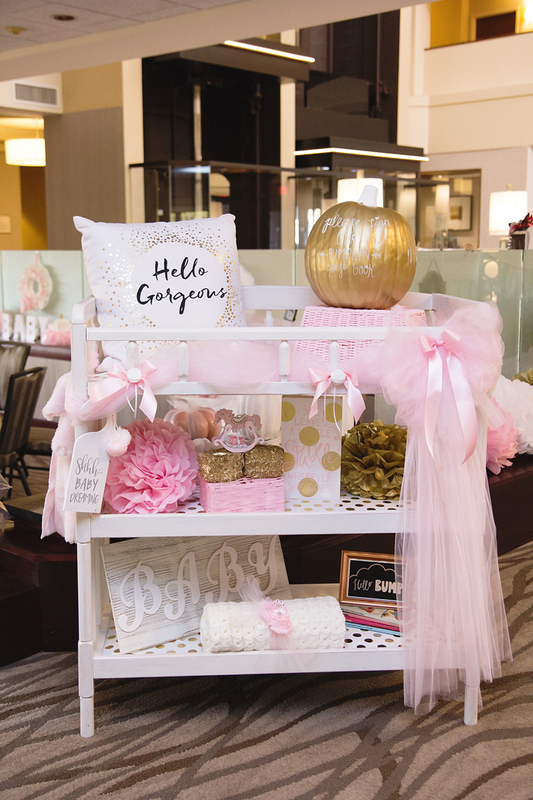 I loved the pink, white and gold, “our little pumpkin” theme. Everything was so pretty and feminine and special. The amount of thought and time that everyone put into the shower was evident in all of the pretty little details. A huge thank you to my mom, cousin Mindy, Aunt Gina, mother-in-law, cousin Jen and more who all pitched in to make this day of celebration so beautiful and full of love. I hope you enjoyed this peek into our special day. Thank you, Kellie! My family made the day so special! What a perfect shower! Congratulations on your little bundle of joy! Everything is so beautiful! I definitely love that Hello Gorgeous pillow! That is perfect! So very excited for you! 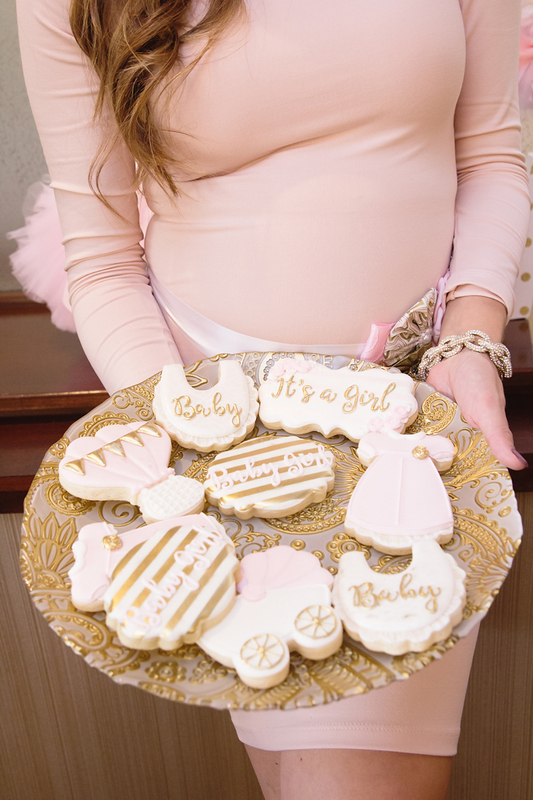 Can’t wait until you show her off in her fabulous outfits just like her mama! Thank you, Michelle! I can’t wait to see who she looks like! What a beautiful shower, I love all of the little details! Thank you, Emily! They did such a beautiful job! Adorable! 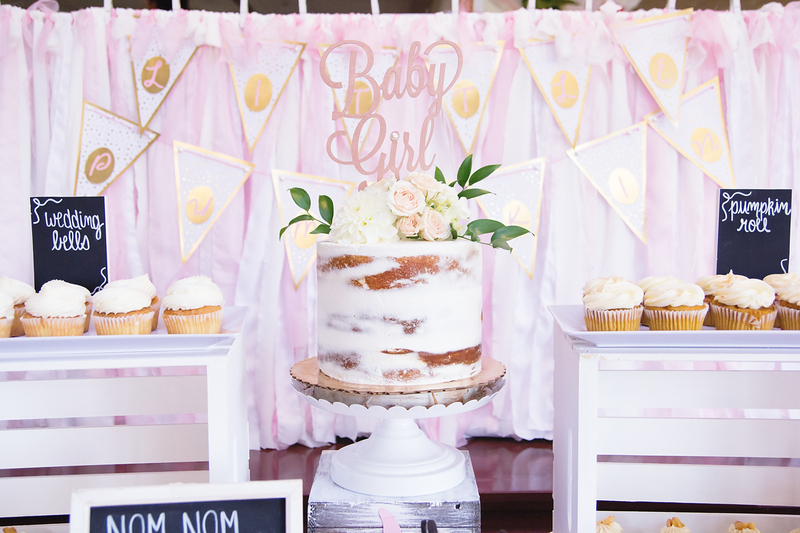 I love all the pink white and gold decorations and details! Beautiful photos! Curious..as a book lover what books were your favorite when you were younger? I loved Goodnight Moon, all of the Disney Golden Books, Beatrix Potter books, Danny and the Dinosaur… So many more too! You look so beautiful! I love those cookies, too! How gorgeous! I hope you are feeling well! 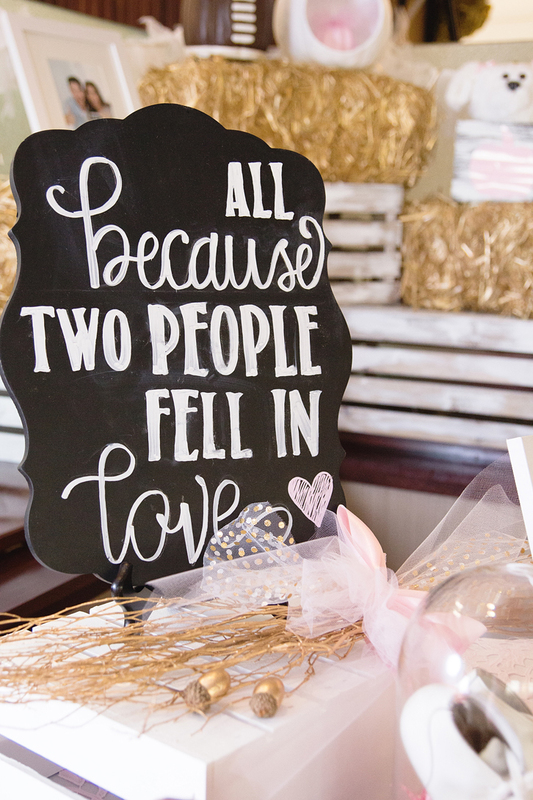 I adore all of the chalkboard writing! This whole party looks so lovely! And you are beautiful!